MANILA, Philippines - Congratulations to our new Criminologists! A total of 13,025 out of 36,516 (35.67%) hurdled the Criminologist Licensure Examination (CLE) given by the Board of Criminology in December 2017. 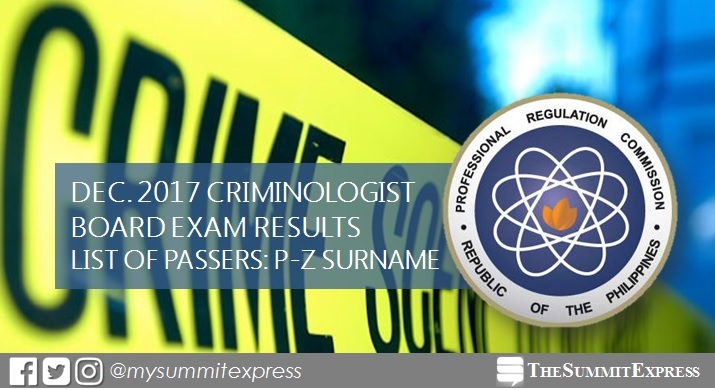 Check out P-Z list of passers and full results on this page. Professional Regulation Commission (PRC) said that results of examination with respect to eight (8) examinees were withheld pending final determination of their liabilities under the rules and regulations governing licensure examination.